The first thing to note is that this muslin has absolutely no shaping along the side seams – below the arms, it’s just a big rectangle. So at this stage, it has the look of a lab coat. 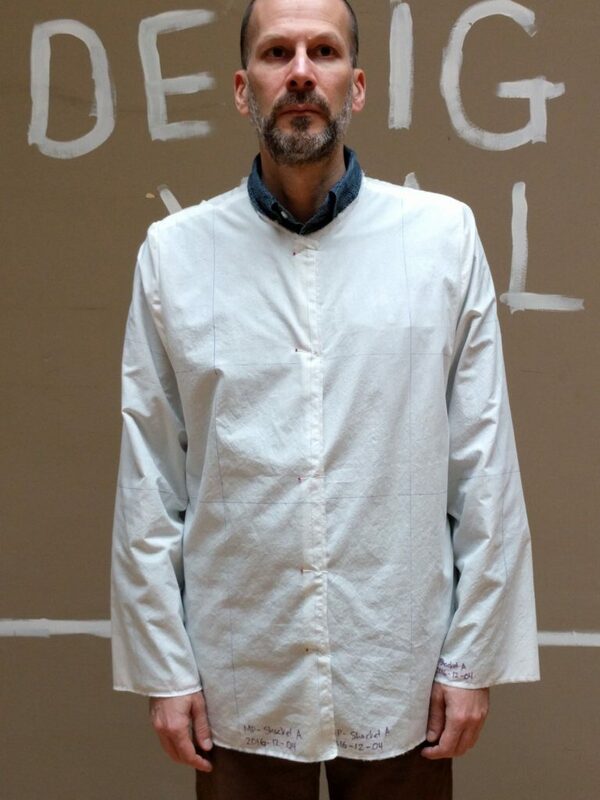 I’m wearing the muslin over normal street clothes in these photos. The overall fit of the bodice is pretty good, and the neckline seems to be falling where it is supposed to. But when I put on a heavy sweater underneath (not pictured) to simulate the extra bulk the fleece interlining would add, I did notice some issues when reaching forward. I felt tightness at back of the sleeve, near the underarm area. This was an issue with the dress shirt pattern, but I left it as-is there because with that pattern I cared about looks more than mobility. But it is an issue I’d like to address here with the shacket pattern. What I did was to restitch the sleeve seams, letting out the seam allowance on the bodice only in the underarm area. I typically use a 5/8 inch seam allowance when sewing muslins, which seems to work well for letting out seam allowances to see if that helps with a fitting issue. This photo, from the disassembled muslin back piece, shows the trial alteration. The original stitching line (with 5/8 inch seam allowance) is drawn in black, the new seam line is in blue. This adds some ease to the underarm area. The sleeve turned out to be a major issue. 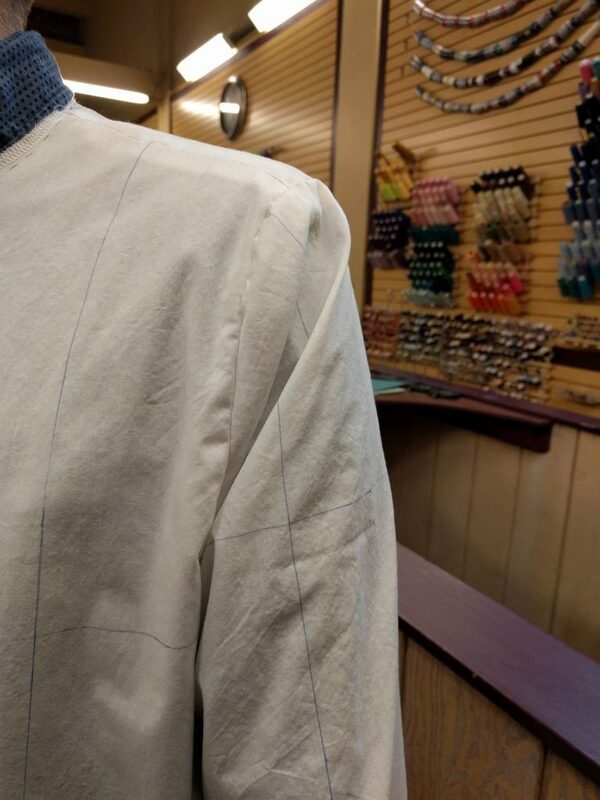 If you recall, in the previous installment I had expressed reservations about the sleeve draft, in particular the length of the sleeve cap seam along the back. It turned out the back of the sleeve was not an issue; instead, problems showed up in front. You can see, especially in the side views, how the fabric clumps up in front. 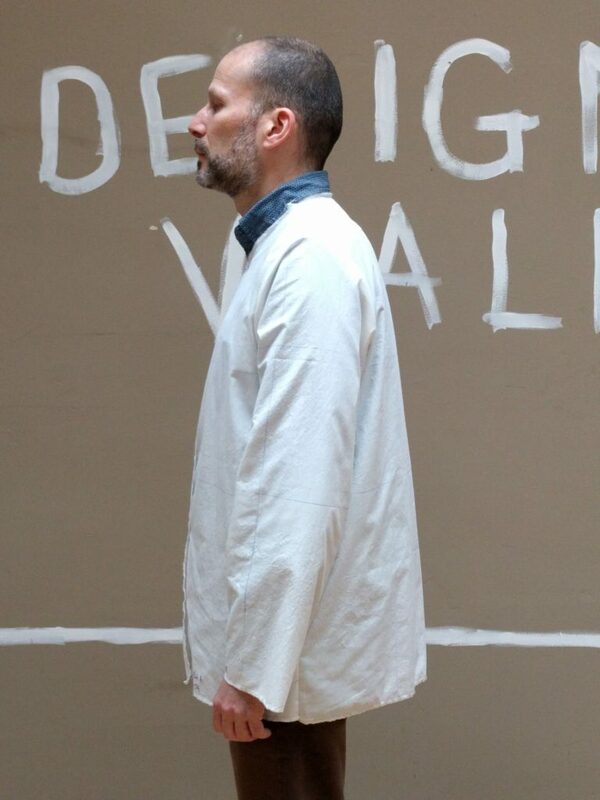 Viewed from the front, there were even strange overlapping folds of fabric on the sleeve. Just when I feel like I’m getting the hang of this fitting thing, I come across a problem that is difficult for me to solve. But I was very fortunate on the day I did this fitting. I was at the Sips N Sews studio, and one of the other members, Zila, took an interest in my fitting. Zila is a very experienced sewist with several decades of experience. Together we started brainstorming ways to solve the sleeve issue. Zila’s first instinct was that there was simply too much fabric in the underarm area. She had me restitch the sleeve to the armhole, but raise the inseam of the sleeve at the underarm point. This basically makes the sleeve shorter at the underarm seam, and takes away fabric there. Then we thought perhaps the sleeve cap needed to be rotated in the armhole. 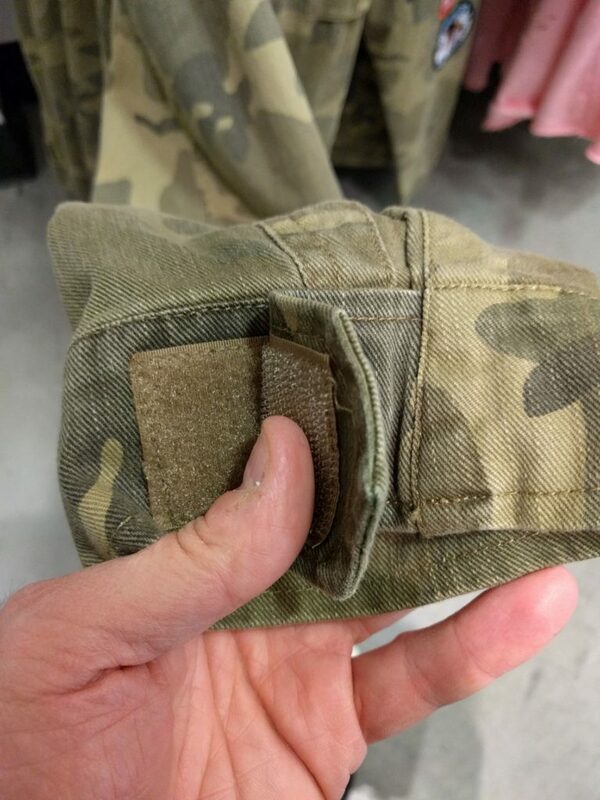 I tried restitching, rotating the sleeve cap about an inch towards the front. 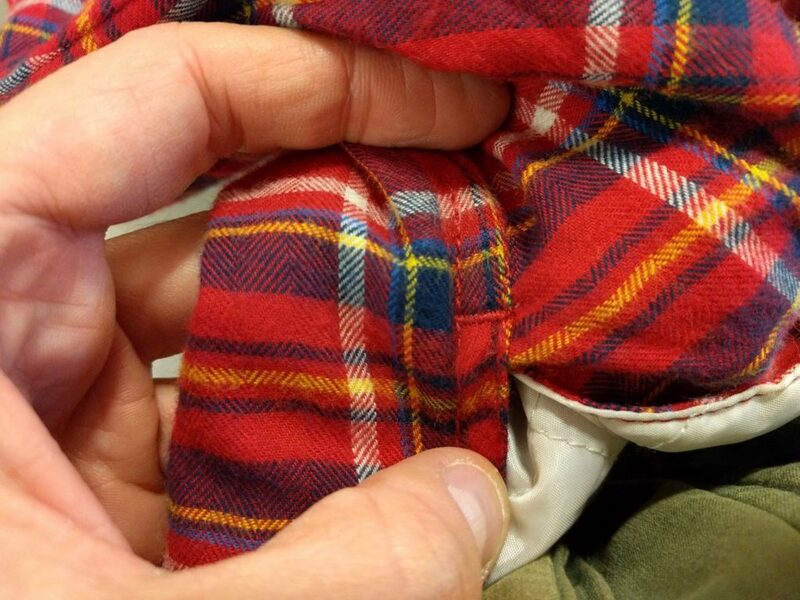 This made matters even worse; an extra big fold of fabric appeared on the sleeve, shown in the next photo. Zila next suggested I rotate the sleeve towards the back instead, and not quite so far as a whole inch. I ripped out the sleeve and stitched it in again, this time rotating the sleeve about 3/8 inch towards the back. (I was aiming for 1/2 inch but was off). This helped a great deal. The crazy folds of fabric in the front largely went away. Viewed from the side, you can see that the grainline of the sleeve now hangs vertically, and the cross-grain is balanced and hangs parallel to the floor. I had a lot of fun working through this fitting issue with Zila’s assistance, and it’s a nice benefit of working in a shared space. She noted my perserverance and willingness to restitch the same sleeve over and over again; I told her that’s nothing compared to what I put my blog readers through. The sleeve draft produced some pretty wide cuffs. At first I was tempted to pin these down to reduce their size, but I was talked out of it by the people at the studio. First of all, it’s always easier to alter a garment that is too large, but if it is too small you are out of luck. Second, the extra width on the cuffs might be necessary once the sleeve is lined. I’ve also started thinking about the kinds of cuffs this shacket will have. 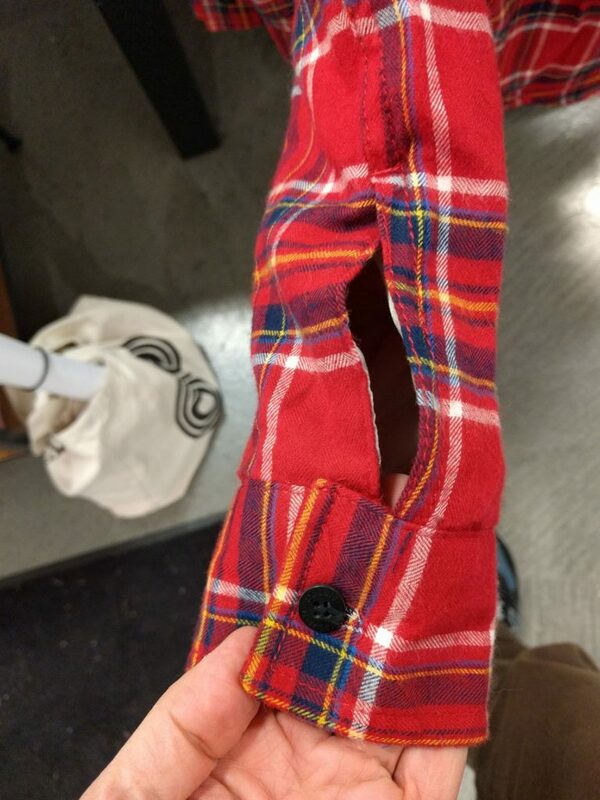 Originally I thought it would have standard shirt cuffs, but I’m wondering how much sense that makes. 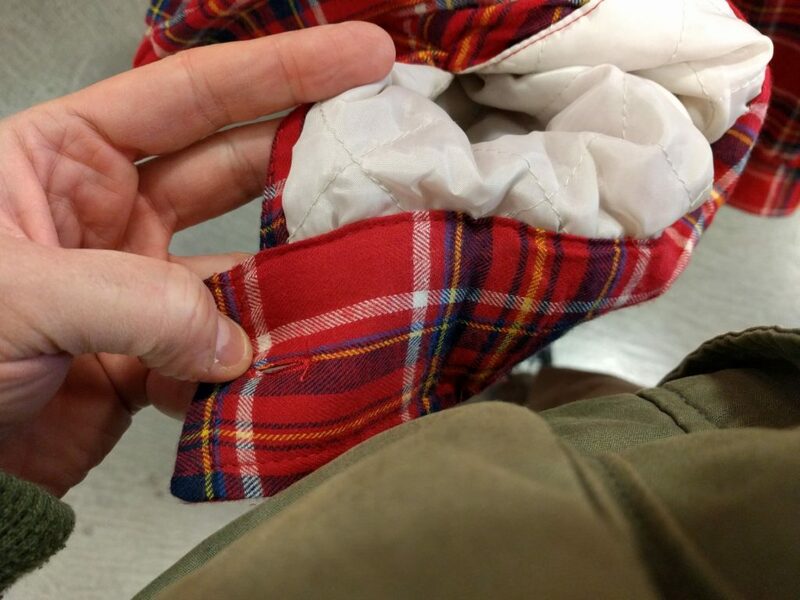 MainelyDad’s shacket has some nice cuffs with an extension tab and oversize buttons. I also went back to the shopping mall and took some espionage photos of the shirtjackets on sale there. What I saw were more shirtjackets with extension tabs on the cuffs. Inside detail of cuff. 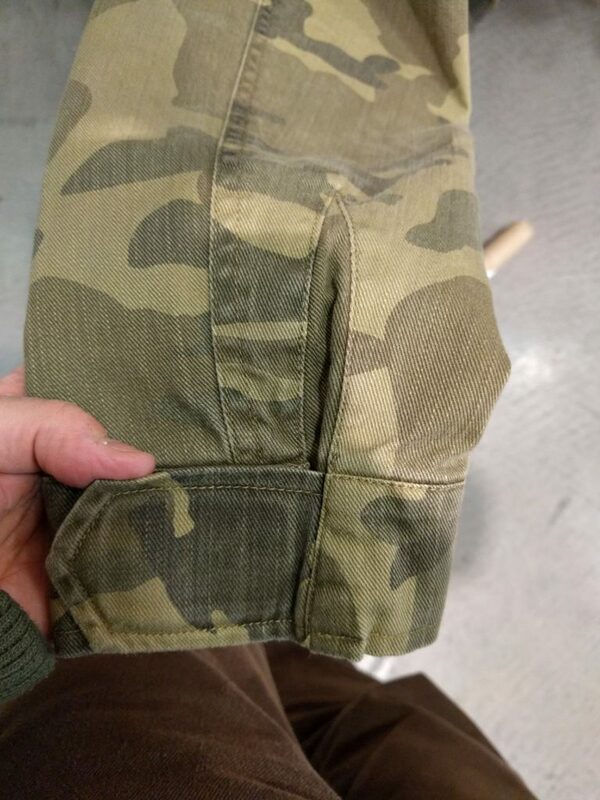 This shacket has a quilted lining. Closeup on the top of the cuff opening – no dainty tower plackets here. A military-inspired shirtjacket with a velcro-enclosed cuff. Again, the cuff has an extension tab. I don’t know yet what the cuff will look like, but this is all good food for thought. I’m thinking that the construction process for the cuff with extension tab is essentially the same as that for a trousers waistband with extension, something David Coffin covers in his book Making Trousers and in his online Craftsy course on the topic. I think I discovered the major fitting issues from this first muslin. However, I need to know the shacket is large enough to fit comfortably over regular clothing, and to know if the sleeve cuff has enough ease. It’s pretty clear the next muslin will have to include linings – both the fleece interlining and the satin lining. 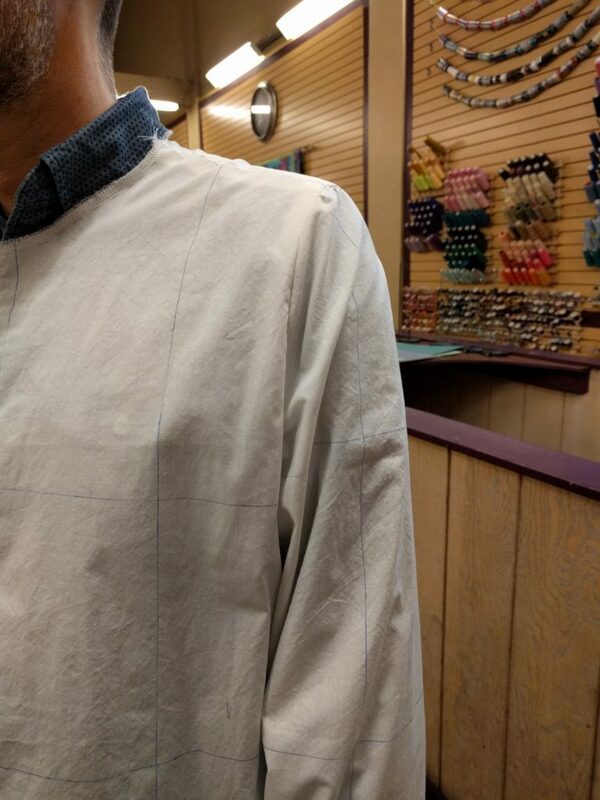 Also, a “hi-fi” muslin will give me an opportunity to draft and test facings and collars. 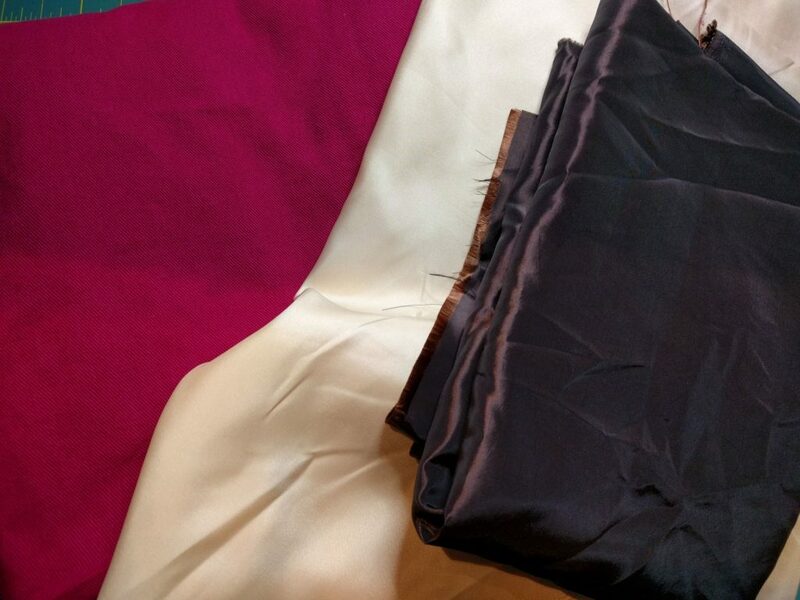 I went through my fabric stash and found some more fabrics to use for the next muslin. The sangria-colored fabric is some bull denim from a JoAnn’s red-tag sale – I had originally intended to use this for jeans muslins, but it should work out well as a shacket muslin because the fabric is of similar weight to cotton flannel. Next up in yellow is a polyester charmeuse, again from JoAnn’s, to line the muslin, and because that might not be enough yardage, another lining fabric (in dark brown) probably for the sleeve. For the interlining I’m going to cannibalize the black poly fleece intended for the final garment, and simply buy some more from JoAnn’s. They aren’t in any danger of running out of the stuff. If nothing else, this project is going to clean out every last bit of ugly JoAnn’s fabric from my fabric stash. I’ll try to have the sangria muslin sewn up for you, and we’ll see how it fits. And maybe – just maybe – we’ll start talking about collars. 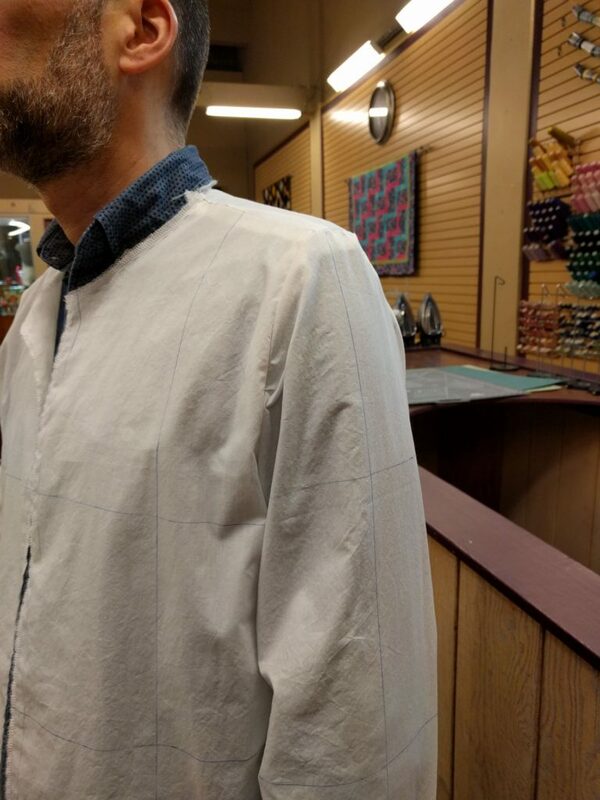 I used Simplicity 1328 for my shacket. The cuffs look like shirt cuffs, but are larger in circumference so my hand cand slip in without un- buttoning. Thanks for the pointer to Simplicity 1328. It looks like an interesting pattern to mine for ideas. I just re-read your blog article on the shacket you made. 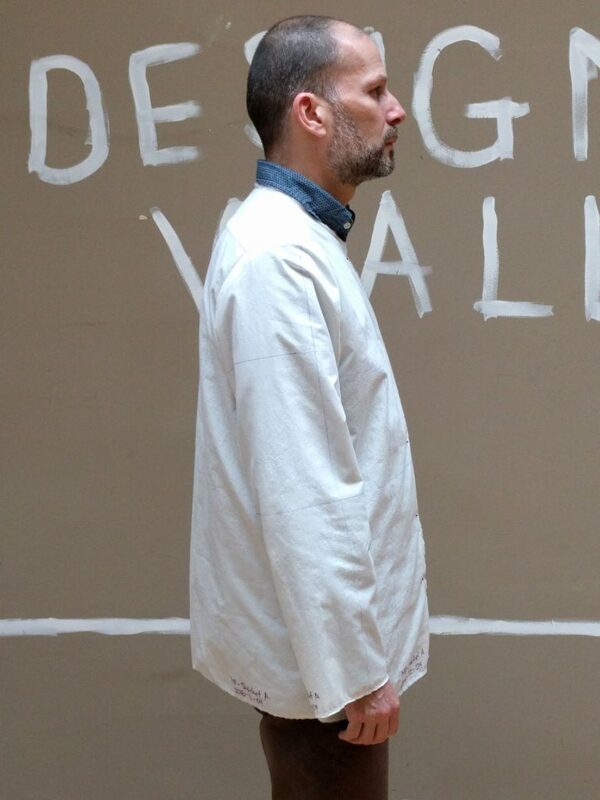 It seems like Simplicity 1328 has a stand collar, and I saw your note about lining the pockets. Note made to self. Thanks. Good work. 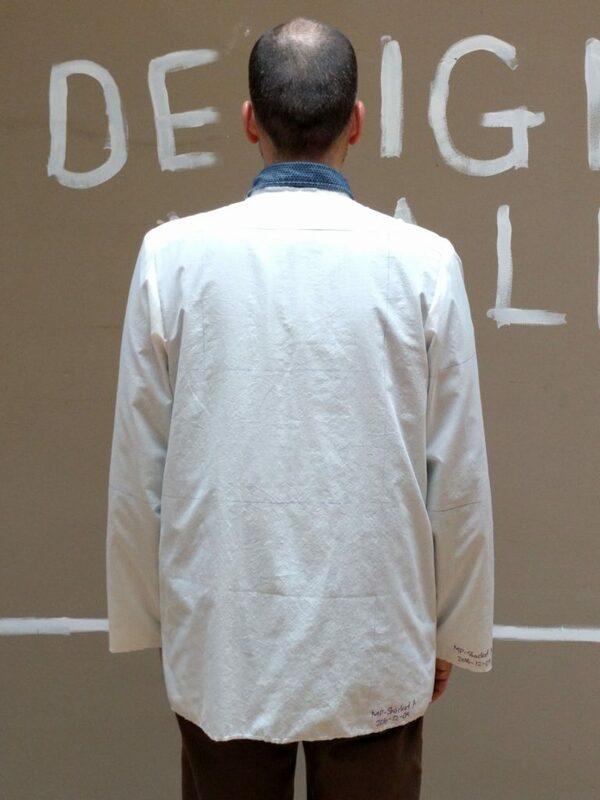 Look forward to seeing what changes you come up with to make this a comfortable jacket. Love the show and tell. I enjoy seeing the true effort in your projects. I know what u mean by lab coat. I am wearing one now, shapeless. I also have the similar idea to use a military coat for a new jacket. A bran new project for me. Thanx to Zita for suggesting to you to rotate the sleeve back. I notice the first muslin side view that the sleeve cap center was in fact too far forward. One of the purposes for a muslin is to locate that sleeve cap in the right place. 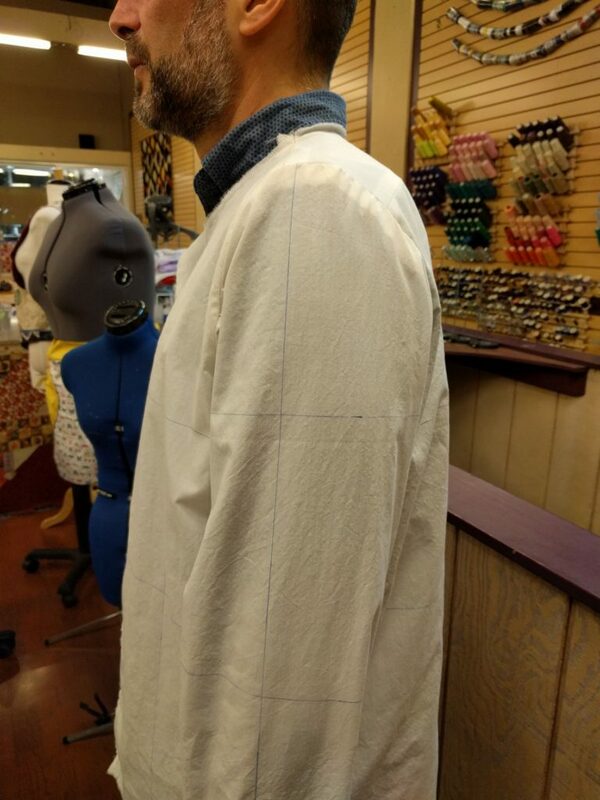 When I do a shirt/jacket/bodice pattern I will first a sleeveless muslin, get the bodice fitted first, including locating the natural shoulder line/seam, the approximate shape of the armhole, and where the center sleeve cap should be. The next fitting will be with a bodice with sleeve(s) and the check for cap location, as well as fit, length, and ease of movement. Also, drawing those location lines for grain correctness should always be done, as shown how they helped you fit your sleeve. 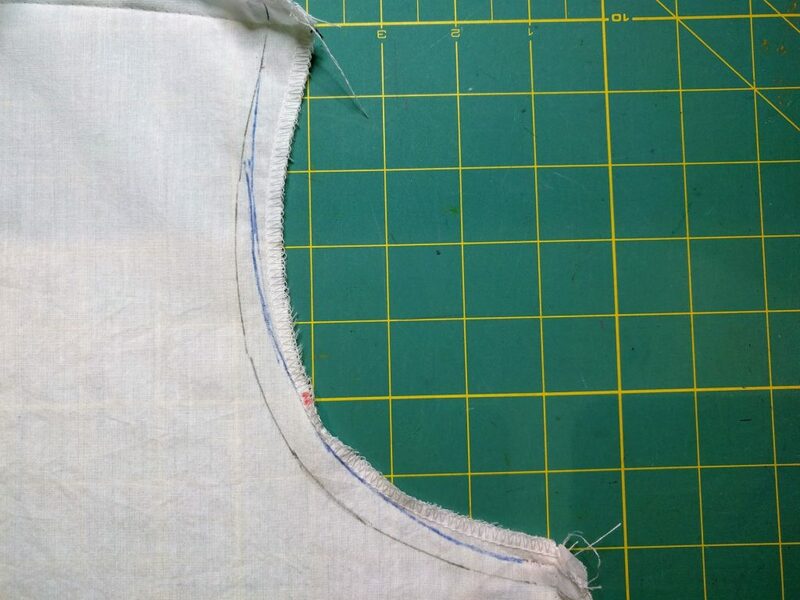 As far as bodice shape goes, on a shirt jacket, you could do a minimal waist suppression by locating you natural waistline on the muslin, and nipping a 1/4 to 3/8 at each quarter pattern piece for a finished 1″ to 1 1/2″ total. You might do more sopping and see if any shirt jackets show some fit.